STUDIA ISLAMIKA (ISSN 0215-0492; E-ISSN: 2355-6145) is an international journal published by the Center for the Study of Islam and Society (PPIM) Syarif Hidayatullah State Islamic University of Jakarta, INDONESIA. It specializes in Indonesian Islamic studies in particular, and Southeast Asian Islamic studies in general, and is intended to communicate original research and current issues on the subject. This journal warmly welcomes contributions from scholars of related disciplines. STUDIA ISLAMIKA has been accredited by The Ministry of Research, Technology, and Higher Education, Republic of Indonesia as an academic journal (Decree No. 32a/E/KPT/2017). STUDIA ISLAMIKA has become a CrossRef Member since the year 2014. 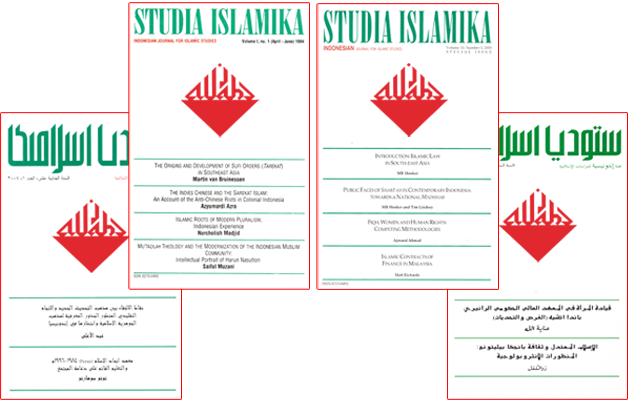 Therefore, all articles published by STUDIA ISLAMIKA will have unique DOI number. STUDIA ISLAMIKA has been entered into an electronic licensing relationship with EBSCO Information Services, the world's most prolific aggregator of full-text journals, magazines, and other sources. Therefore, the full text of STUDIA ISLAMIKA also can be found on EBSCO’s Arab World Research Source and Humanities Source Ultimate. STUDIA ISLAMIKA has been indexed in Scopus and Thomson Reuters (Emerging Source Citation Index). All publication by Studia Islamika are licensed under a Creative Commons Attribution-NonCommercial 4.0 International License.